In July 2016, Clowns Without Borders Sweden went to Palestine to train girls and boys in Nablus West bank. They did 52 workshops for 105 people. 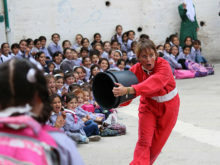 In May 2014, Clowns Without Borders Spain went to Palestine with the support of the UNRWA to perform 25 shows for 5973 people from the Palestinian population in the West Bank. In 2013, Clowns Without Borders Sweden went to the city of Nablus in Palestine and performed 12 shows for 2863 people. 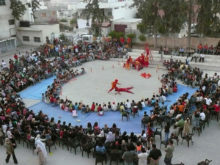 In 2007, Clowns Without Borders Sweden went to the West Bank to perform 10 shows for 4000 people. 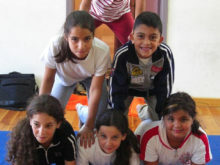 In 2007, Clowns Without Borders France to the West Bank to give one week of workshops for 7 Palestinian artists pertaining to the Palestinian Circus School, and also performed 10 shows for 4000 people. 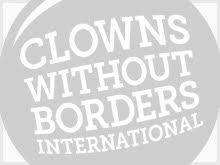 In 2006, Clowns Without Borders Sweden went to the West Bank and performed 10 shows for 4000 people. In August 1995, Clowns Without Borders Spainand artists from Sevilla performed in Palestine. In August 1995, Clowns Without Borders Spain traveled to Palestine.